The "Take It!" Came from one of those all of a sudden one is faced with a visual knock out. 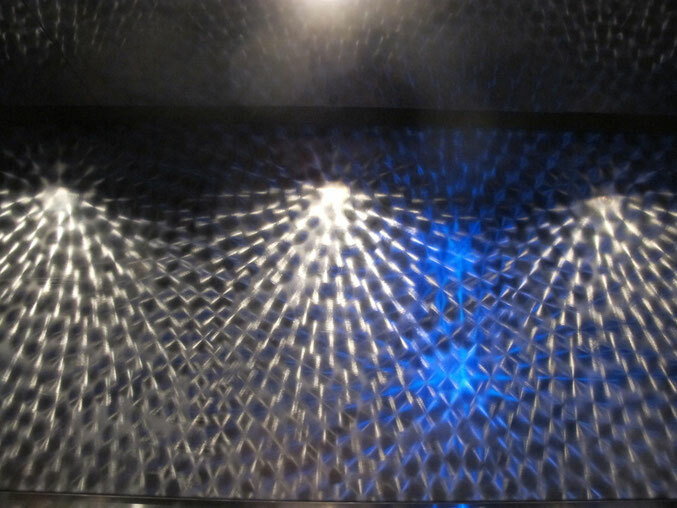 This one came in the form of waiting for an elevator - and having one arrive, then the doors open and on the back wall of the elevator was this ever so cool tooled metal with just the right lighting on it to make it jump. Needless to say - I was blown away. The way the lighting creates an almost 3 D effect is unreal. That there is a hint of color that comes off of it due to the convergence of reflected color is a great touch. The After Take: To those I showed the photos to - everyone thought they were extremely cool. Some thought they would make a great subject for a blow up print, even going as far as having it matted and framed. I will give this some thought. I want to thank everyone that gave comment with this shot in the eyelusions section. So many were absolutely spot on. The only thing that was not guessed was the location of the elevator as the where for this bit of art work. I tried having the label be the clue. Here is hoping you too have a similar elevator door opening experience. Thought it was headlights through a funny filter. Nice shot!